Beautiful looking cigar that comes slightly box-pressed and wrapped in nice looking dark leaf that comes with some veins on it. The pre light draw is little in the loose side but good with some aromas of dry wood, cocoa and leather. The first few puffs delivers a punch of pepper that fades to allow the creamy silky smoke with sweet tobacco flavors in with medium body. As the cigar progress the smoke gets more complexity to add a shot of espresso, leather, earth and pepper of course. The body is building up as the burn goes down, the upper medium at most. Some sweetness here and there while with hints of cocoa and caramel. The cigars burns razor sharp from start to end with no real need of a touch up at any time. 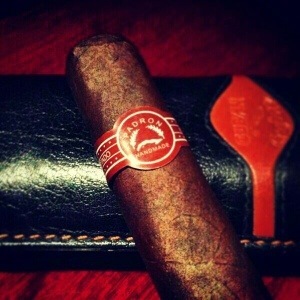 I like it so much because it delivers what you expect from a Padron to do. It has all the elements the brand suppose to offer, however I have to admit that it’s not like the 64. The 64 is more complex and the flavors are bolder so it worth the extra $$ you pay on. Anyway if you didn’t try one its highly recommended specially if you have no idea what Padron is all about. You simply can’t go wrong with these, especially for the price. The ones I’ve had have been pretty homely, but then again, beauty is only skin deep.